CANNABIS THERAPEUTICS IN D.C.: Dr. Sunil Aggarwal, Elvy Musika who gets 300 joints each month from the DEA, Dr. Jeff Hergenrther re cannabis use for Crohns disease, Dr. Robert Melamede Pres of Cannabis Science + Doug McVay with Drug War Facts. Reports from Wash DC & Natl Medical Cannabis Unity Conference: Philippe Lucas of Vancouver Island Compassion Society, BIll Piper of Drug Policy Alliance, Gar Roberts a Maryland acitivist, Howard Wooldridge of Citizens Opposing Prohibition, Amy Rising of Iraq Vets against the war, Michael Krawitz of Vets for Med Cannabis, Doug McVay with Drug War Facts, Aaron Justice of "Buds and Roses", Dr. David Bearman, Mimi Friedman of Colorado Patients Group + clips from major media. Unvarnished Truth: Russ Jones a speaker for Law Enforcement Against Prohibition joins UT host Dean Becker. 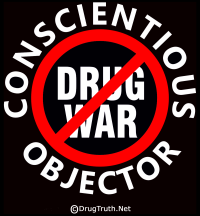 Additional videos from around the continent re failure of drug war.